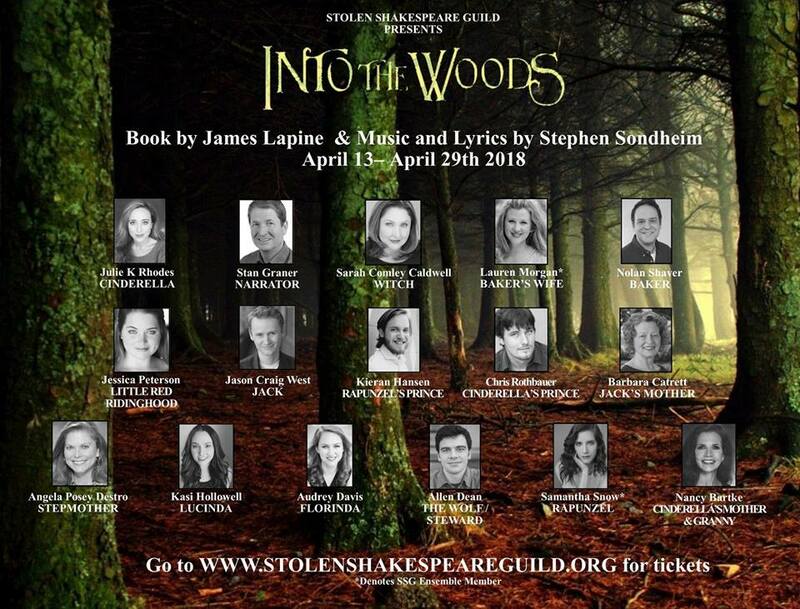 I’m very excited to announce my next project on stage: I’ll be playing Little Red Ridinghood in Into the Woods with Stolen Shakespeare Guild! For more information, visit SSG’s website HERE. See ticket information below the full cast announcement! I am very pleased to announce that I have been cast as Mrs. Claire Holmes in Brick Road Theatre’s production of The Secret Garden! This show has one of the most beautiful scores I’ve heard from any stage, so you definitely don’t want to miss it! Check out the full cast list, and then details on how to get your tickets below! This enchanting classic of children’s literature is reimagined in brilliant musical style by composer Lucy Simon and Marsha Norman, the Pulitzer Prize-winning playwright of ‘Night Mother. Orphaned in India, 11 year-old Mary Lennox returns to Yorkshire to live with her embittered, reclusive uncle Archibald and his invalid son Colin. The estate’s many wonders include a magic garden which beckons the children with haunting melodies and the “Dreamers”, spirits from Mary’s past who guide her through her new life, dramatizing The Secret Garden’s compelling tale of forgiveness and renewal. If you haven’t already seen on my social media, I’m thrilled to announce more news from Funimation! I recently finished recording Retsu Narumi, the bubbly and supportive BFF to Empress Yui (kind ruler and giant robot) in Regalia: The Three Sacred Stars. You can get all the details over at Funimation’s website (just click HERE). Regalia: The Three Sacred is currently available for pre-order, and will officially go on sale on September 5, 2017. I’m very excited to be a part of Stolen Shakespeare’s Production of On the Town! This show is hysterical and has an amazing score composed by Leonard Bernstein! I will be playing Lucy Schmeeler, as well as appearing in the ensemble. See below for information on how to get tickets and more show details! To order tickets by phone please call Theatre Mania at 1-866-811-4111. Or just click on the performance you want to attend below. Visit Stolen Shakespeare Guild on Facebook! Fort Worth Community Arts Center in the Sanders Theater, 1300 Gendy St. Fort Worth. SSG uses flex ticket pricing. Take advantage of our early bird discounts. This production is rated G.
Hope to see you there!! Come on, who wouldn’t love hair like that? You can check out the full cast announcement HERE. On sale dates have not been announced yet. More news from Funimation coming in the future! I’ll keep you guys posted! I am very excited to be a part of this moving production. Not only is it forcing me to work on an Irish accent, but it’s the first straight play I’ve done since college, and I’m loving it! Come see me play Lizzie Brennan, a sassy and somewhat spacey Irish lass who just wants to get married, no matter the cost. A homeless couple taking shelter in the ruins of a castle on a hillside in Ireland find a bag of money. Immediately, they are forced to make decisions that will affect the rest of their lives. *This play is rated PG-13 for mild domestic violence. Skunks? Lizards? Parodies of Eagles Music? A Southern gal living in a Cowboy boot? What more could you ask for? THE OLD WOMAN WHO LIVED IN THE COWBOY BOOT is the newest offering from Billy’s Globe House. Perfect for all ages. Don’t let Scooter down by missing out on this great show! Perfect for all ages and we welcome Day Care, School and Homeschool groups. Tickets start at only $5! TICKET PRICES for the children’s show: Adults $7.00, Senior 65 and up $6.00, Children 12 and under $5.00, and Children 2 and under are free. Saturday, August 13th @ 10:30 A.M.
Friday, August 19th @ 10:30 A.M.
Saturday, August 20th @ 10:30 A.M.
Friday, August 26th @ 10:30 A.M.
Saturday, August 27th @ 10:30 A.M. Call 817-713-1835 for group rates! I am so excited to be working in Fort Worth this month with Stolen Shakespeare Guild. And what a perfect show: Singing in the Rain! If you’re looking for hilarious gimmicks, tap dancing, and pure musical theater fluff, you’re in for a real treat with this show. It’s just plain fun from start to finish! Friday August 12, 2016 @ 8:00 P.M.
Saturday August 13, 2016 @ 2:00 P.M.
Saturday August 13, 2016 @ 8:00 P.M.
Friday, August 19, 2016 @ 8:00 P.M.
Saturday, August 20, 2016 @ 2:00 P.M.
Saturday, August 20, 2016 @ 8:00 P.M.
Friday, August 26, 2016 @ 8:00 P.M.
Saturday, August 27, 2016 @ 2:00 P.M.
Saturday, August 27, 2016 @ 8:00 P.M.
Sunday, August 28, 2016 @ 2:00 P.M.
Take advantage of our early bird pricing on the first and second weekends! Check out the beautiful cast! I’m so excited to announce that I have been cast in The New Moon at Lyric Stage! This is a big step for me professionally for many reasons, and I could not be more thrilled. We’ve been in rehearsal for a week and half already and I’ve never worked with such a talented cast before; it’s truly a pleasure and a joy to go to rehearsal every day. And the best part (aside from the incredible singers I get to sing with) is that the show is accompanied by a full, live orchestra! This is so rare and such a treat; you won’t want to miss the show! Wasn’t that glorious? And believe me, the rest of the show is just as wonderful. Lots of laughs, romantic tension, and the noble fight for a fairer world. What could be better? Performances will be in the Irving Arts Center’s Carpenter Performance Hall, 3333 N. MacArthur Blvd., Irving, Texas. The production will feature the 35 piece Lyric Stage Orchestra under the baton of music director Jay Dias. Andy Baldwin will make his Lyric Stage directorial debut with THE NEW MOON’s 44 person cast. Tickets are available @ www.lyricstage.org or by calling 972-252-2787. THE NEW MOON was composer Sigmund Romberg’s third hit in a row and the last of the great Broadway comic operettas. The original Broadway production ran for 519 performances at the Imperial Theatre (September 19, 1928-December 14, 1929). The Desert Song (1924), Student Prince (1925), The New Moon; no other composer produced three in a row like this, of such quality and with such success. Perhaps The New Moon is his most impressive. Lyric Stage’s production will be a once in a lifetime opportunity for North Texas audiences to hear this glorious score sung by an ensemble of incredible singers accompanied by the 35 piece Lyric Stage Orchestra. “Lover, Come Back to Me,” “One Kiss,” and the rousing “Stout-Hearted Men” are three of the hit songs from Romberg’s greatest score. Christopher J. Deaton and Kristen Lassiter, stars of Lyric Stage’s THE DESERT SONG and THE GOLDEN APPLE, return to Lyric Stage as star-crossed lovers Robert and Marianne. The cast also features Ellie Hertel, Kyle Coughlin, Daron Cockerell, Ryan Appleby, James Williams, Sonny Franks, Kasey Yeargain with Ben Phillips, Cristina María Castro, Neil Rogers, Scott Sutton, Taylor Quick, Russell Batchelor, Sarah Comley Caldwell, Brendon Gallagher, Julie Rhodes, Parker Fitzgerald, Kelly Silverthorn, Susan Metzger, John Wenzel, Jacie Hood Wenzel, Justin A. Duncan, Jillian Paige, Hunter Lewis, Katreeva Phillips, Benjamin Stidham, Rachael Blizzard, Jonathan McInnis, Jocelyn Hansen, Jonathan Hardin, Madeline Metzger, Jeremiah Johnson, Rachel Ratcliff, Daniel Bouchard, Emily Hagens, Colin Phillips, Jessica Peterson, J. Anthony Holmes, Samantha Whitbeck, Matt Beutner, Caroline Ellis and Chapman Blake. Hello friends! I hope everyone is having a wonderful and gratitude filled November; I personally can’t wait to spend Thanksgiving with friends and family, eat a delicious turkey dinner and enjoy the Macy’s Thanksgiving Day Parade! Caroling season has begun for the Goode Time Carolers of Dallas! We perform all over DFW for a multitude of restaurants, private Christmas parties, and other holiday events, but these are the dates/places where you’ll be able to easily see me performing in public. The Goode Time Carolers will be singing from 1:00 pm to 6:00 pm each scheduled day at Southlake. Friday, November 27 – enjoy some Christmas carols while you do your crazy shopping on Black Friday! We’ll be there all afternoon. Interested in hiring The Goode Time Carolers for your Christmas event? Check us out at our website!